May Nixon from Making Music In Manjimup has been in touch to let us know about the Manjimup Bluegrass & Old Time Music Weekend scheduled for October 3,4,5th this year. The festival is also hosting a song writing competition. If you love to write songs, or have dallied with the idea of writing a song or two, why not try writing a bluegrass song? There is prize money of $400 and the song will be performed at the free saturday night concert and posted to YouTube. Click the link below and find your way to the Song Competition page for details. Please move the site round amongst your friends and music lovers. And do like us on Facebook – it’s a great form of advertising. Visit the Manjimup website or their Facebook page for more information. Your lyrics must use the word Manjimup at least once. Your lyrics must use the word LIVELIGHTER at least once. Your entry must have its own song title. By entering this competition you agree that you have read the rules and agree to abide by them. Entrants must be 15 years or older. Entries that have any thing on them which may identify the composer will be disqualified. All entries must be submitted via email only, on or before midnight September 5th 2014, Perth time. Use Song Competition in the subject line. 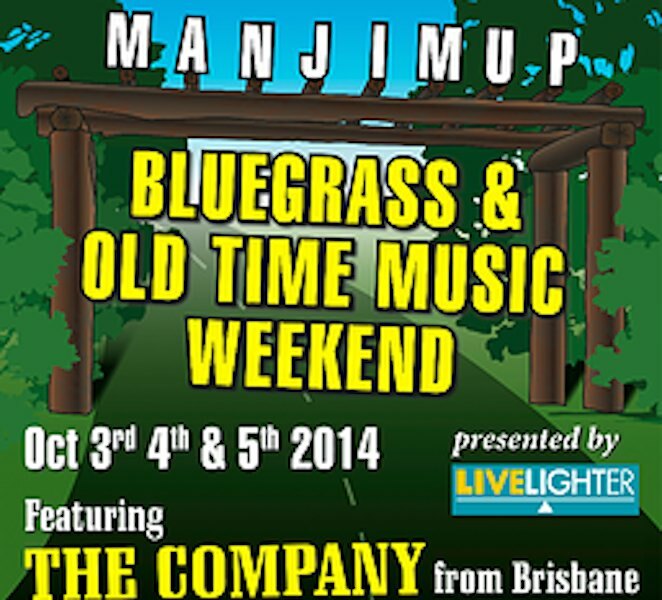 Send your entry to: bluegrassmanjimup@gmail.com. Your entry must be identified only by the number given as a receipt of your registration via the Manjimup Bluegrass & Old Time Music Weekend website. Please put your entry receipt number, eg. 1234 at the top of the page. Alongside or just below your identifying number, state which song you have chosen as the pattern for your song. Lyrics to be typed in a size 16 font, preferably on one page only. The winning entry will be performed by The Company in their concert on Saturday, October 4th 2014, in Manjimup, Western Australia. The winner will be announced at this concert. The judges’ decision is final. The winning entry will receive AUS$300. If the composer of the winning lyrics is in the audience at the time of the announcement, the winner will receive a $100 bonus prize. If the prize winner is not in the audience, a cheque for $300 will be sent to the winner and the $100 bonus prize will be retained by the Warren Arts Council. The cash prize is available only to Australian residents, with the exception of the winner being present at the concert in Manjimup on October 4th 2014. In this case, the winner will receive a cheque for AUS$400. If the winner is not an Australian resident, and is not present at the concert in Manjimup, Western Australia on October 4th 2014, the total prize money will be retained by the Warren Arts Council to promote future arts related events in Manjimup, Western Australia. Copyright and use of material – The author retains copyright of the material they enter. The Warren Arts Council has the right to use the winning entry for promotional purposes for future music related events held in Manjimup.